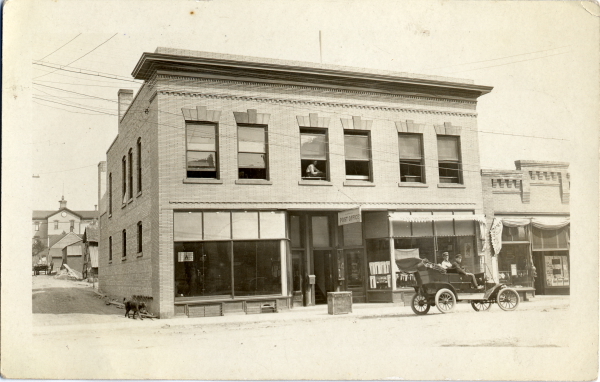 The McLaury Building on South Franklin Street was built in 1909 by Glenwood Postmaster Eilert Koefod to house the Glenwood Post Office. The building burned on May 4, 1958 and was torn down in October 1959. No building was ever rebuilt on the site. It is currently the open seating area next to the Village Inn Bar. Photographer A.S. Nelson (Albert S.) rented space upstairs and was storing some equipment there when his main studio burned down. He moved into the Post office building shortly thereafter and had his studio there until 1915 when he sold to C.L. Voss and Voss Studios. The post office moved into a new location in 1929. The building to the left was originally known as the Conrad Building. It is now the meeting room of the Village Inn. Franklin Street. McLaury Building is in the middle of the block. 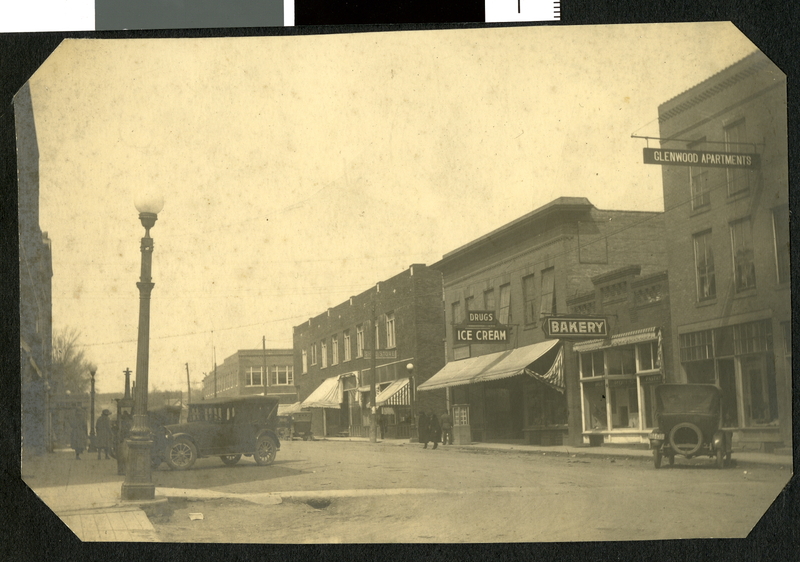 This entry was posted in Collection Notes and tagged McLaury Building, Pope County History, Pope County Minnesota, Pope County Museum, Setter Drug. Bookmark the permalink. Is there a way for me to get copies of the photographs you have of the McLaury building? Also, do you have a file archived for the McLaury family? Thanks, so much. You bet! We did extensive research on this building and its occupants. Are you in the area and interested in stopping by? Or would you prefer e-mail? (I have your address since you sent in a comment to the site.) If you have photographs of the inside of the building, or stories to share, please let us know. No, I’m not in the area. I live in Reno, NV. I had talked with you a while back about yearbooks from 1955 – 1960 that I was trying to find – which I actually found. How would I get the copies of the photos? My grandfather, John L. McLaury was the owner of the building and I lived there with my mother, Madge, and dad, Donald, in the building from the time I was a little girl until it burned down. You also have an old 8mm movie of a parade that I was walking in with a doll and a buggy which is about 1947 or 1948. My folks owned the Red Buggy Antiques on Hwy 55 across from Mt. Lookout and next door to the Hilltop.